Building has increased in many coastal markets in a big way as we move through 2018. The chart above highlights the markets with the largest increases in the number of units under construction between 3rd quarter 2017 and 3rd quarter 2018. Los Angeles is the clear-cut leader, with about 12,000 more units currently being built than at this time last year. 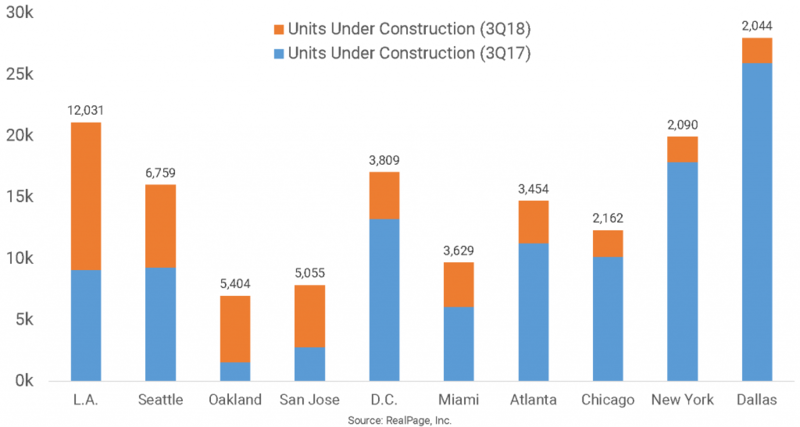 But Seattle (an increase of 6,800 units, up to almost 16,000 units total), Oakland (an increase of roughly 5,400 units) and San Jose (with about 5,000 more units underway in 3rd quarter 2018 than at the same time last year) are other West Coast markets with large year-over-year increases. On the East Coast, Washington, DC, Miami and New York have also experienced large increases. Atlanta, Chicago and Dallas are the only interior markets within the nation’s top 10. Carl Whitaker is a Market Analyst for RealPage, Inc., where he blends in his passions for geography and teaching to foster a practical, applied understanding of apartment data and analysis. He specializes in creating in-depth reports and presentations to allow for easier consumption and application of data and analysis. Prior to joining RealPage, Carl was a Market Analyst for Axiometrics and an analyst for Catalyst Commercial, a Dallas-based economic development solutions firm. Carl received a bachelor’s degree in secondary education and a master’s degree in applied geography from the University of North Texas.